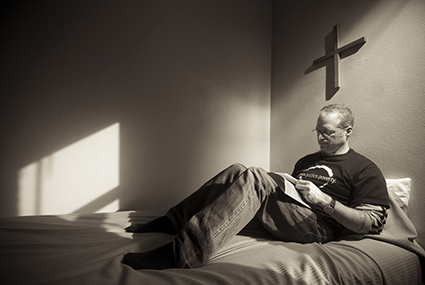 Rest, relax, renew on a personal retreat at Holy Wisdom Monastery. Retreats available for a couple of hours, a day, an overnight, a weekend or longer. Face it. Life is hectic. The job, the kids, extended family, home, bills, finances, friends, emails, texts, pets and other obligations all add up to make life full, but can also bring stress and anxiety to our bodies and minds. Taking time out for a personal retreat to provide some solitude in your life is necessary to reboot your coping mechanism and quiet your mind. Holy Wisdom offers overnight guest rooms and two hermitages for personal retreats which help to calm and refocus the mind. You’ve made the reservations and arrangements for child care, taken time off from work, covered any other commitments and traveled to Holy Wisdom. What do you do once you get here? “Slow down and rest,” says Jody Crowley Beers. “Most of us live at a running pace, never having enough time to do all of the things we want to do. She added that sleep is one way to guide oneself into a retreat environment and that it’s ok to give yourself permission to sleep before doing anything else. Jody is an oblate and a member of Sunday Assembly at Holy Wisdom Monastery. She worked at Saint Benedict Center from 1997-2006 and is a student of spirituality, counseling and natural science. A former Catholic sister for 45 years, Jody has been involved in teaching, spiritual direction, chaplaincy, peace and justice advocacy, pastoral and diocesan service and has been evangelized by the poor in the U.S. and Guatemala. Doing nothing. Sit in a comfortable position with your back straight and feet on the floor. Pay attention to your breathing. Draw in peace with each breath and breathe out negative energy. Take a nature walk or sit outside in a location with a pleasing view. Let nature help your body feel its way into a slower pace. Write a letter to yourself. Ask “Where am I at this point in my life?” or “How am I feeling about myself, about my relationships?” Or write a letter to a wisdom figure, an ancestor, yourself as a little child or to an older person (yourself in 10 years). Do a life review. Divide your life into decades; give a descriptive name to each decade. Write down life-changing events by decade. Discover how you feel about these now. What do you want the next decade of your life to bring? Make a list of your values. List what is really important to you and where that value came from (your mother, a childhood experience, church etc.). Look closely at the list, are there some values you want to reinforce, can some be released, are there some that have faded with time? Paint or draw as a way to get in touch with your inner reality. Remember that you aren’t creating a masterpiece, but getting in touch with a part of yourself. Have a dialogue with your body. While in a comfortable position in a quiet space, ask yourself “What am I feeling in my body at this time?” Focus on areas that call out to you such as a pain somewhere or tension in your back or neck. Take a life inventory. Think about the happiest times of your life and write them down. Think about when you’ve been the saddest, felt most alone, most confident, least confident. Write in a journal. Include responses to the question, “What am I feeling?” while journaling so that you are attuned to your feelings. Meditate. Focus your mind to reach an inner calmness and a sense of tranquility. Observe silence. Rather than feeling like you need to make conversation with others, take the time to fully engage in your own thoughts and feelings. During a personal retreat, you set your own schedule. While meals and optional communal prayer are at a set time, your time is your own to use as you wish. It might be difficult at first to settle your mind and actually relax; reminding yourself that calmness is what you need can be helpful. Some people take more than one day to fully calm the mind to relax while at a retreat center because of the new surroundings. Reserving more than one overnight is a good idea to help reach a state of relaxation and forget the stresses of your life. Start reserving your personal retreat today by filling out our availability inquiry. Contact us for more information about personal retreats at 608-836-1631, x158 or personal-retreats@benedictinewomen.org.